A 200 year old invention may at last be ready for market. Read my latest for The Economist in full below or by following this link. THE Stirling engine, the brainchild of a 19th-century Scottish clergyman, is an invention that seems cursed by the gods of innovation neither to succeed nor to fail comprehensively and thus be forgotten. 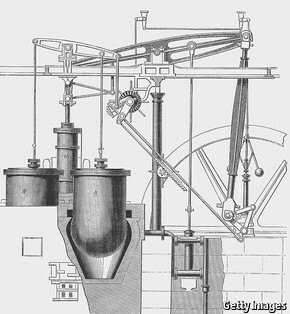 In 1816 Robert Stirling patented a device he hoped would sweep aside the then-dominant “atmospheric” steam engine. Instead of a messy process of using steam to make a vacuum beneath a piston, thus causing atmospheric pressure to drive the piston down, Stirling’s version (illustrated) uses the heating and cooling (and thus expansion and contraction) of gas sealed inside the engine to do the piston-driving. Engineers love the idea for its elegance. But it did not appeal to the industrialists who were its intended market. They preferred the tried and trusted way commercialised by James Watt. Nor, when given a second chance by the revolution which ousted steam in favour of the internal-combustion engine, did Stirling’s invention manage to redeem itself. But engineers are a cussed bunch and have found, over the years, a few niche applications for various forms of Stirling engines. One version, called a free-piston engine, runs backwards: it uses mechanical energy as the input, rather than the output, to pump heat away from where it is not wanted. In other words, it is a refrigerator. These specialised fridges chill the infra-red sensors on orbiting telescopes. On the basis of that success, some engineers believe free-piston engines can be brought down to Earth and deployed in a less recherché role. They think them ideal to replace Rudolf Diesel’s smelly, polluting motors in the generators that provide electric power to the countless tropical villages not yet connected to their countries’ national grids. Two groups in particular are planning to do this. One is at Sunpower, an American company founded by William Beale, the principal inventor of the free-piston design. The other is at the University of Oxford, and is led by Paul Bailey, Mike Dadd and Richard Stone. Both have previously built and deployed satellite-cooling systems, and both now plan to use free-piston engines to drive electricity generators. From a user’s point of view the Stirling approach has two advantages. One is that because, like a steam engine, a Stirling is an external-combustion engine, it can run on a variety of fuels. Both designs can thus be powered by wood, dried animal dung or more or less anything else that will burn. The second advantage is that a free-piston engine suffers little wear and tear, so it should be able to run for a decade or more without servicing. (One of the Oxford group’s designs has already survived for 15 years in the harsh environment of space.) This is because cylinder and piston are in line with the alternator that they drive in order to produce the electricity, eliminating the need for a crankshaft, and also because an external-combustion engine does not have to withstand the continual explosion of fuel inside its cylinder, so it can use special bearings that greatly reduce wear. Such a design can be powered by nothing more than sunshine concentrated by a concave mirror. That approach was being employed by Infinia, an American firm. Unfortunately, despite having a contract to build a solar farm containing 429 of the things for the American army, Infinia filed for bankruptcy protection. This may prove just a glitch; Qnergy, an Israeli-based producer of Sterling engines, recently acquired Infinia’s assets. But even two centuries after the first heroic failure, it does suggest that the curse of Robert Stirling has still not quite been lifted.